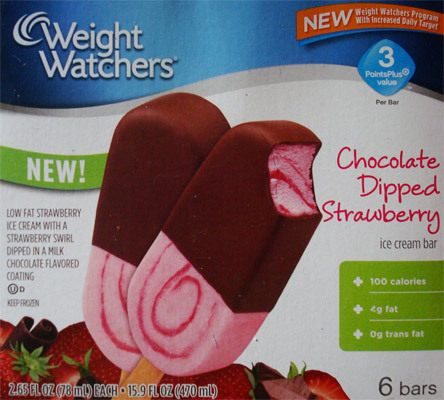 [By Nick] There seems to be an endless variety of weight watchers ice cream products. It makes a lot of sense when you think about it though. Everyone loves ice cream yet nobody wants to gain weight. I’m fine with it because I love having a huge selection of treats to choose from. This leads to today’s product.. Unlike its siblings that I have reviewed, these ice cream bars sport a milk chocolate shell instead of the dark chocolate one. It only makes sense because the combination of milk chocolate and strawberries is very popular. You don’t see dark chocolate covered strawberries all that often. 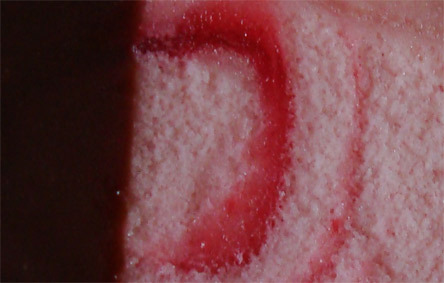 Other than that these bars are built the same way in that the shell is only covering half of the ice cream. A little freezer burnt but that’s probably my fault. These have been sitting in my freezer for over 2 months now. Despite the iciness, the bar still manages to be creamy. It has more of a frozen yogurt feel to it now but that's not a deal breaker for me. The flavor is spot on to that of a real chocolate dipped strawberry albeit slightly more artificial. Of course that’s to be expected since berry flavors haven’t been replicated too well by food manufacturers. The milk chocolate shell works the same as the dark chocolate shell and adds sweetness that helps mask the artificial strawberry flavor in the background. Once you make your way through the first half with the shell it just goes downhill. The fake strawberry flavor just becomes cloying and overpowering. It’s like they took a strawberry and thought hey this isn’t enough flavor so they injected it with strawberry flavoring to give you an off strawberry flavor. The shell is what kept the flavors together and once it’s gone the bar just becomes a mess of artificialness. Verdict? Good shell, not so good ice cream. Buy Again? Not likely, unless they decide to fully dip the bar.